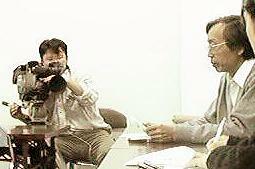 Emergency Meeting Stop the export of nuclear power plant to Taiwan! Stop the export of nuclear power plant to Taiwan! 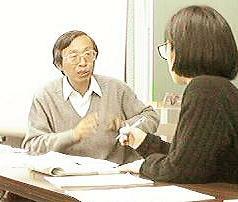 October 19, 1996, just on the day we were having the Pacific Basin No Nukes Conference by Peoples in Kobe, we got a shocking news from Taiwan. It said that the Legislative Yuan, the Parliament of Taiwan, had decided to continue the construction of the fourth nuclear power plant in Gong-Liau, the northern part of Taiwan. Two guests from Taiwan were supposed to attend the conference to appeal not to export nuclear power to their country. 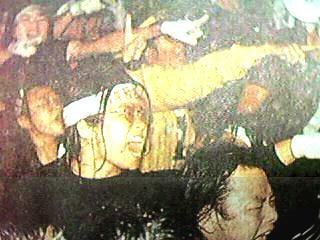 But as the situation became critical, they had to give up to come to Japan. On the day of the conference, they were also in front of the Legislative Yuan in Taipei with thousands of people who were struggling against the fourth nuclear power plant construction. In solidarity with anti-nuclear movement in Taiwan, we held an emergency meeting, inviting Mr. Shih Shin Min, one of the executive members of the Taiwan Environmental Protection Union or TEPU. 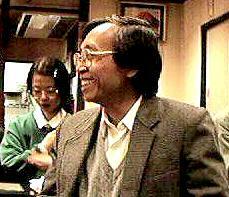 On may 24, 1996, a resolution which asks the Executive Yuan to abolish all the nuclear power projects was passed by the Legislative Yuan with majority of 76 to 42 votes. On June 12, the Executive Yuan, insisting that nuclear power was necessary to Taiwan, asked the Legislative Yuan to reconsider the resolution. According to the constitution of Taiwan, if more than one third of the legislators accept the reconsideration raised by the Executive Yuan, the original resolution is considered to be vetoed. The number of the legislators who were opposing to the nuclear power was only about a half of the total number. So they tried not to let the Legislative Yuan review the reconsideration of the resolution. But they failed. 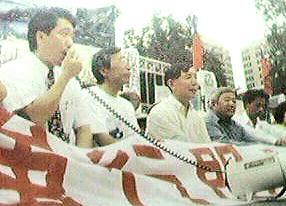 On October 8 the Legislative Yuan, being dominated by the ruling party (KMT), scheduled to review the reconsideration on October 15, 17 and 18. To defend the resolution to abolish all the nuclear projects in Taiwan, strong protest actions were immediately organized in front of the Legislative Yuan. In the afternoon of October 14, the residents of Gong-Liau Village, the planned site of the fourth nuclear power plant, held a demonstration in front of the main entrance of the site. They marched into the territory of the plant and stayed there until they were rudely lifted out by the riot police on the next day. 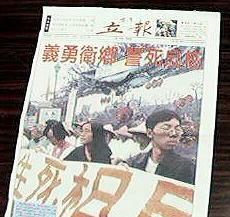 Early in the morning of October 18, many anti-nuclear groups and supporters joined the protest. About two thousand people gathered to Legislative Yuan. Most of them sat there peacefully. One group went to the president palace to protest and was stopped by the police. Two people were arrested. In the assembly hall, the legislators of the opposition parties tried to stop the reviewing process but at 7:30 pm the legislators started to veto and the results were announced at 9:30 pm. 83 legislators agreed to accept the veto of the resolution. It meant that the construction of the fourth nuclear power plant would legally continue. When the protesters outside knew that the legislators were going to veto, the atmosphere became tense. Some protesters were so angry that they removes the blockades and pulled down the entrance door. 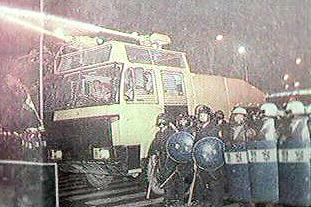 The riot police sprayed water and fired tear gas to disperse the protesters. When the outcome of the veto was known, about 20 students pulled the entrance door down again and rushed into the Legislative Yuan. They were stopped by the riot police. Some of them were violently beaten and arrested. Finally the riot police forced the crowd to leave there and finally the protest ended at about 11:30 pm. Majority of the Taiwanese people are opposing to the construction of the fourth nuclear power plant. They don't wish to increase nuclear power anymore in their country. However, the Taiwan government is enforcing its nuclear policy, just ignoring the peoples protest. As you know, the main contractor of this project is GE, General Electric and the sub-contractors are Hitachi and Toshiba. Mitsubishi is also going to join this project exporting the turbine. We would like to ask this question to all the people who live in the countries which are promoting nuclear power to Asian countries. Don't you think we are going to invade the Asian countries with nuclear power technology?Don't you think we are going to take a fatal step to hurt the people in the countries by exporting the worst and lethal pollution? After the meeting, we had supper with Mr. Shih Shin Min. 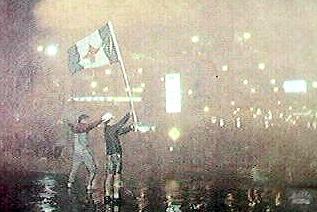 At that time, he said "I believe in our victory. We have the power. We'll continue our struggle in our country. So I hope you do your best to stop the export of nuclear power from your country. Please let me give an example. The Vietnam War was ended. 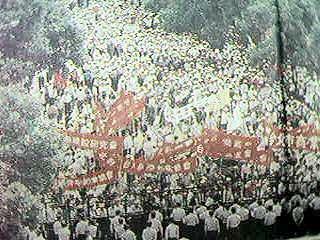 Apart from the struggle of the Vietnamese people, the strong protest of the American Citizens also played the important role to end the war. Japan are going to export nuclear reactors to my country, but it doesn't mean you are our enemy. I think our solidarity will surely change the situation"